Black Swan Yoga (BSY) is a Texas-based yoga chain that provides a variety of class options with an accessible drop-in donation rates as low as $10 per class. They also offer online classes. BSY's philosophy is that since yoga is a transformative practice that has the power to change a person, mentally, emotionally, and spiritually, it should be available to anyone. The studio stands by their philosophy with its diverse offerings and skilled staff of instructors. There are four different types of classes offered at Black Swan Yoga. 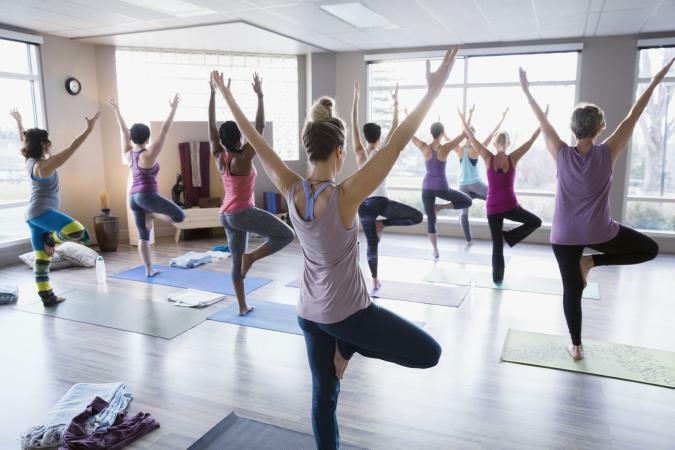 Beginner's - This class reviews basic yoga poses at a slow pace, so that those who are new to yoga can build a strong foundation of knowledge and strength. Vinyasa Flow - This format is faster in pace. It links asana practice with the flow of your breath, so that you move with each inhale and exhale. It is appropriate for those at all levels who have an understanding of the basic moves. Power - Power is for the intermediate to advanced yogi. The class is delivered at a relatively fast pace and includes more challenging poses, most notably arm balances. It requires a solid foundation of strength and flexibility. Hot Onnit - A combination of yoga, cardio, and strength, this class provides students with a great workout, using Onnit fitness equipment. The goal is to help yogis build muscular strength and provide a bridge for those who typically attend strength workouts to become flexible through yoga practice. The studio is also heated to 90 degrees to allow for an increased burn. There are three cities in Texas with Black Swan Yoga locations. You'll find three BSY locations in Austin. There is one location in Dallas. It is open from 6:00am to 11:00pm Monday through Thursday, 6:00am to 8:30pm Friday, 8:30am to 8:00pm Saturday, and 8:30am to 9:30pm Sunday. For those who don't live in the area or who prefer an at-home practice, BSY offers an array of classes through their online platform, bsy.tv. Membership includes unlimited streaming of all uploaded videos, which can be accessed from any mobile device with an internet connection. The range of lessons they offer online is even more diverse than those offered in-studio. Classes are grouped into channels by instructor, with the exception of the acro yoga channel, which stands on its own. If you're considering a bsy.tv membership, but are unsure of whether or not you're ready to commit, they offer a free eight-day trial with the input of your payment information and choice of commitment, which ranges from monthly to yearly. In addition to yoga and workout sessions, Black Swan offers a variety of events that are open for public registration. Workshops are available that allow you to explore specific aspects of the practice, such as heart opening, physical alignment, managing thoughts and emotions, and more. Retreats are designed to help you unwind and destress from the rigors of daily life. They are sometimes held at tropical locations, such as Costa Rica. Charity practice is organized to raise awareness about issues plaguing underserved populations and to collect funds that can help serve them. Yoga Teacher Training is offered to educate the next generation of instructors. BSY's yoga teacher training is at the 200 hour level and registered with the Yoga Alliance. If you're interested in exploring BSY's upcoming events, head over to their Facebook Page, where you'll find more information along with details on location and ticketing. Black Swan Yoga stands out as a studio that encourages diversity and accessibility through their pricing and the multitude of offerings they provide both locally and online. So if you've been hoping to try yoga or simply want to diversify your practice, it's worth checking them out. If you live in Houston, Dallas, or Austin, drop in to a class at the nearest location. You'll find a schedule of classes on the Black Swan Yoga website. If you live elsewhere, access their online offerings through the bsy.tv portal.